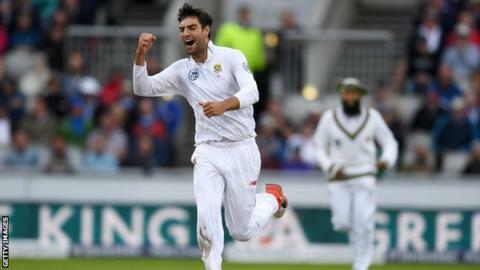 Yorkshire have signed South Africa fast bowler Duanne Olivier on a three-year Kolpak contract. Olivier, 26, played for Derbyshire in 2018, and is one of the world's most in-form pacemen, having taken 31 wickets in five Tests since being recalled by South Africa in December. His overall total of 48 wickets in 10 Tests has lifted him into the top 20 bowlers in the ICC Test match rankings. He also took 31 wickets in seven Championship games for Derbyshire. The terms of the Kolpak deal mean that he will not be able to play for South Africa again until his contract with Yorkshire expires. After taking 24 wickets in South Africa's three home Tests against Pakistan, to be named player of the series, he then claimed seven more scalps in two Tests against Sri Lanka. "I would be lying if I said this wasn't a difficult decision to make," he said. "It's giving up playing for my country with no guarantees of playing international cricket again. "But, at the end of the day, I needed to be true to myself. I've only got this one chance to see where my talent can take me and Yorkshire just felt right to me. "I came over to the UK last year and thoroughly enjoyed my time playing county cricket. I have since realised I could happily base myself there for the foreseeable future. "I was originally looking to come back as an overseas player but, when I got a long-term offer from Yorkshire as a Kolpak, I knew that signing would be the best option for both myself and my family." Yorkshire director of cricket Martyn Moxon said they hoped Olivier would be a "long-term" signings. "It's for an initial three years but we're hoping it will be for longer than that," he continued. "Duanne is a proven wicket-taker as we've seen in the series against Pakistan and Sri Lanka. He's got genuine pace so he gives us a different dimension within our seam bowling attack. "We're mindful that we've got some talented young seamers, but several of them have had injuries so we have to manage them carefully over the next couple of years. It gives us that strength in depth to compete on all fronts." Yorkshire, county champions in 2014 and 2015, survived a relegation scare in 2018, before recovering late in the season to finish fourth. As well as Ryan Sidebottom retiring at the end of the 2017 season, they lost Ben Coad (48 wickets in nine games) and skipper Steve Patterson (24 wickets in eight games) to injury in 2018. The pair missed 11 matches between them, while David Willey played just twice because of England commitments. The Tykes were then further hit in their pace department by the end-of-season loss of their leading wicket taker Jack Brooks (51) to Somerset and Liam Plunkett to Surrey for the 2019 season.